Swamp Gun (Nineteenth Battery) | Just Shooting Memories! Today (Tuesday) was lots of fun. 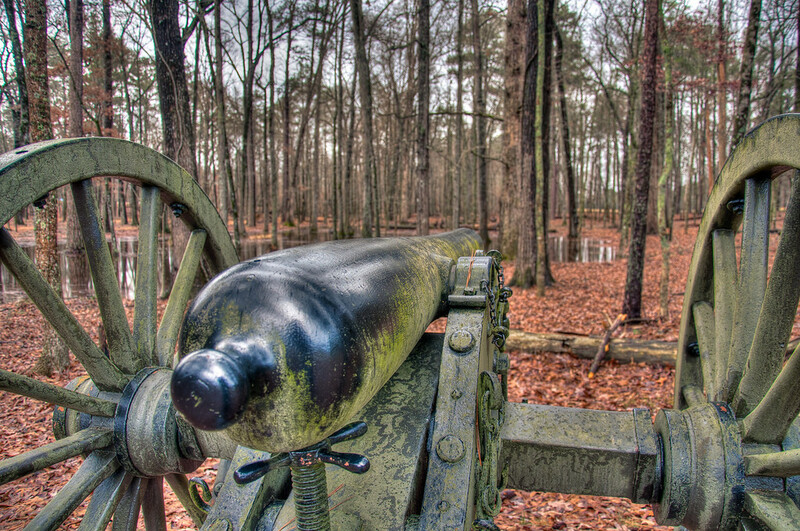 A dramatic trip to Chickamauga National Battlefield Park (a continuation of the “Silent Guns of the South” series) and the Tennessee Aquarium. I did the unthinkable at the aquarium though…I left the camera in the car. I was driving down the road which passes through the center of Chickamauga National Battlefield when I saw this line of cannons at the edge of a field. The cannon were not pointed into the field like most of the others. These were pointed into the forest. It had been raining a lot and this area of woods is very low lying and made a small swamp in the middle. These are the guns of the Nineteenth Battery, Second Brigade, Fourth Division, Fourteenth Corp from Indiana. This was their position on September 20, 1863 most of the day. Standing here in the rain, I can just imagine how miserable the soldiers from both sides had to have been at this point in the war.